Health Care for All Oregon (HCAO) is the a coalition of more than eighty organizations representing labor, businesses, health care professionals, faith communities and groups of diverse citizen activists around the state. We are working to create a comprehensive, equitable, publicly funded, high-quality, universal health care system serving everyone in Oregon and in the United States. 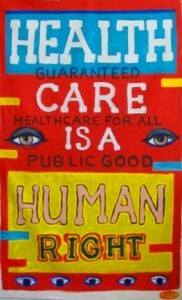 Like police and fire protection, good school and clean water, health care is something we all need. Until we all have access to high-quality care, we aren’t living up to our American ideal of a just society.